Winmate added a high-end 19-inch Intel Haswell-powered version to this formidable lineup of super-sealed panels, and optional for -40 to 70 deg C with built-in intelligent heater. Winmate's G-WIN Series consists of rugged and unusually well-sealed vehicle or stationary-mount Panel PCs available in a wide variety of configurations. Depending on the intended application, G-WIN panels have been available with 5-wire resistive touch displays measuring 8.4, 10.4, 12.1 or 15-inches diagonally. Since the sealed nature and high reliability requirements of the G-Win line precluded fans and cooling slots, G-Win Panel PCs were designed with low power processors that didn't generate a lot of heat. That meant either Intel Cedar Trail or, more recently, Intel Bay Trail processors. While even Bay Trail is still based on the Intel Atom processor architecture, higher end quad-core Bay Trail chips such as the quad-core N2930 used in several G-Win models have grown quite powerful. Sometimes, however, an even larger display is needed, and even higher performance, and that's where the new 19-inch G-Win panels come in. This new 19-inch G-Win panel does not only offer considerably more screen real estate than a 15-inch model — about 90% more in fact — but the larger case also provides enough extra heat dissipation to allow the use of Intel Haswell Core processors with their higher thermal design power and significantly higher performance. The two processors Winmate makes available in the 19-inch panel are the Core i5-4300U with a base clock speed of 1.9GHz and turbo frequencies up to 2.9GHz, and the Core i7-4650U with a base rate of 1.7GHz and a top turbo speed of 3.3GHz. Both are part of Intel's 4th generation "Haswell" lineup, and both are considered ultra-low voltage versions with thermal design powers of 15 watts. The primary difference between the two processors is the type of integrated graphics. The i5 chip comes with Intel HD Graphics 4600 whereas the i7 processor has HD Graphics 5000 with 40 instead of 20 execution units. That means the i7 chip offers significantly higher graphics performance. The i5-4300U is popular in high-end rugged tablet computers, so this Winmate panel packs a good processing punch. Compared to the Celeron N2930 used in G-Win models with smaller screens, the 4300U's raw computing performance should be about 50-60% higher. For mass storage, the G-Win 19 comes with 4GB of DDR3L 1600 SO-DIMM RAM in a single slot. Standard mass storage is a 64GB mSATA solid state disk. Larger ones up to 256GB are available. Note that Winmate offers the 19-inch panel in two versions, one that's sealed to the IP65 level, and the one described here that carries full IP67 sealing. What do the ratings mean? The "6" means both versions are totally protected against dust. It's the highest solids rating a device can get. The second number indicates protection against liquids. A "5" means the device is protected against water sprayed from all direction, with limited ingress permitted. That's generally good enough if a computer is just occasionally subjected to rain or splashing, but it wouldn't do in a marine environment and in other settings where it can get very wet. The "7" in IP67 means the device is actually protected even when immersed in as much as one meter (3.3 feet) of water. The extra protection means some compromises as it is not possible to offer the full complement of standard I/O that's usually present in a Panel PC. 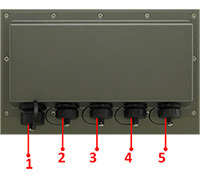 So whereas the IP65 version offers a standard I/O panel in its back (see sidebar to the right, top illustration), the IP67 version has special waterproof M16 type of connectors with screw-on caps (see sidebar to the right, bottom illustration. That means less I/O than the IP65 version. Other interesting ruggedness specs include a built-in intelligent heater that boosts the standard 14° to 140°F (-10° to 60℃) operating temperature range all the way up to -40° to 158°F (-40° to 70℃) for when things get really extreme. Winmate also conducts Mil-STD-810G testing for shock and vibration.